British mystery writer Margaret Cole who co-wrote over thirty detective stories with her husband G.D.H. Cole was a prolific author. 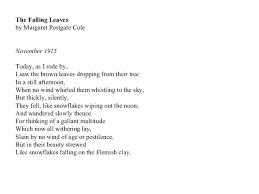 Part of the Postgate family from the North York moors, Margaret also penned poetry and several nonfiction books. She later went into politics and was awarded a DBE. Her ancestor’s land grant was awarded in the year 1200, and through the centuries the family was notable in many fields including science, music, education, journalism, and entertainment. Film and stage actress Dame Angela Lansbury is Margaret’s cousin. She and her family were staunch socialists and became pacifists during WWII. Her brother was jailed after his exemption as a conscientious objector was denied and he refused military orders. 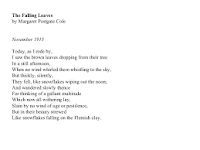 Her poem “The Falling Leaves” is one of her most famous works and is one of the first anti-war poems from a woman’s perspective. When Hitler began to overrun Europe, Margaret abandoned her pacifism, however she continued to be active in the socialist cause. During a campaign against conscription, she met and married G.D.H. Cole. They joined the Fabian Society, an organization whose purpose is to advance the principles of democratic socialist via reformist efforts rather than revolutionary overthrow. The couple eventually moved to Oxford where they taught and wrote. Their first mystery novel “The Death of a Millionaire” was published in 1925. Published in 1948, their final novel was “The Toys of Death.” Series characters were Superintendent Henry Wilson, Everad Blatchington, and Dr. Tancred. 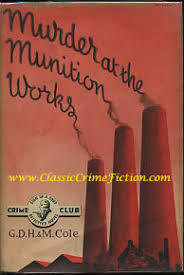 Their book “Murder at the Munition Works” was published in 1940, and the story is woven around wartime production, shop stewards, and walk-outs. Because of its topic, one scholar theorizes that Margaret’s husband wrote the book in its entirety rather than as a collaboration with her, however, there is no proof. Most readers agree that the Cole’s early works are their better novels with ingenious ideas, complex characterizations, and sharp satire. And despite being considered as good as Agatha Christie’s stories, the Coles and their books have faded into obscurity. Mystery Monday: Who was Bernice Carey?